On October 1, President Barack Obama ascended the podium in the Diplomatic Reception Room at the White House and declared negotiations with Iran a tentative success. "The P5-plus-1 is united, and we have an international community that has reaffirmed its commitment to non-proliferation and disarmament. That's why the Iranian government heard a clear and unified message from the international community in Geneva: Iran must demonstrate through concrete steps that it will live up to its responsibilities with regard to its nuclear program. In pursuit of that goal, today's meeting was a constructive beginning," Obama said, adding, "but it must be followed by constructive action by the Iranian government." Where Obama sees tentative success, reality suggests failure. Faced with irrefutable evidence, Tehran acknowledged that it had built a second, covert nuclear-enrichment plant, squirreled away in an Islamic Revolutionary Guard Corps base near Qom. Neither Obama nor the director of national intelligence, Dennis C. Blair, acknowledged that Iranian confirmation of its second enrichment plant belied the veracity of the 2007 National Intelligence Estimate. Regardless, Tehran's decision to confess when confronted with proof of cheating should not be considered the same as Iranian transparency and goodwill. Many scientists within the International Atomic Energy Agency believe that the Iranian regime now has "sufficient information to be able to design and produce a workable" nuclear bomb. Obama's supporters have rallied to put the best face on the P5+1 dialogue. "Obama . . . got more concessions from Iran in 7½ hours than the former administration got in 8 years of saber-rattling," Juan Cole, president of the one-man Global Americana Institute, wrote on his blog. Former Carter administration adviser (and October Surprise conspiracy theorist) Gary Sick was likewise effusive, calling the meeting a "historic moment after thirty years of mutual recriminations and hyperbole." The truth, however, is that any agreement was short of specifics. Iran pledged to allow inspections, but offered no specifics as to when and under what conditions. While Iranian authorities pledged to ship uranium to Russia for further enrichment, the West has no guarantee that Iranian scientists will not simply enrich the fuel further when it is repatriated to Iran. Not surprisingly, the Iranian regime has been defiant in recent days. Ahmadinejad called Obama's criticism of Iran's second enrichment plant a "historic mistake," hardly a sign that the Iranian regime feels sincere about complying with international demands. Jomhouri-ye Eslami, a daily closely associated with the Islamic Republic's intelligence apparatus, editorialized, "The announcement of the enrichment facilities forced the West into a defensive position," and Kayhan, which voices the line of the "supreme leader," wrote, "The announcement of the enrichment facilities will be Iran's winning card in October negotiations." The Obama administration may convince itself that it remains in control of the diplomatic process and has placed serious constraints upon any Iranian breakout capability, but countries with more at stake know better. Last month's Iranian test of ballistic missiles capable of hitting Saudi Arabia and Israel underscored both the danger and questions about Iranian sincerity. Different threat perceptions muddy the international approach to the Iranian nuclear challenge. For the European Union, the Iranian nuclear challenge revolves around the viability of the nuclear Non-Proliferation Treaty as well as the efficacy of European foreign policy on the international stage. After all, the Islamic Republic's proliferation activities marked the first international crisis in which the European Union consciously sought to lead. Should Iran go nuclear despite years of critical engagement, it would be a blow to the multilateralism-and-incentives approach favored by European foreign ministries. For President Obama and most of the American foreign-policy apparatus, a nuclear-weapons-capable Islamic Republic would be strategically untenable. A nuclear Iran would embolden Tehran to act out conventionally and by proxy, hiding behind its own nuclear deterrence. Growing Iranian prestige and ability to project power would force other regional states to make accommodations with Tehran that might not be in the U.S. national-security interest. Any additional nuclear power in the Middle East would also unleash a cascade of proliferation: If Iran went nuclear, Saudi Arabia and Turkey would need to develop their own capabilities. If Saudi Arabia and Turkey went nuclear, Egypt and Greece would as well. A nuclear Egypt would lead Libya to reconsider its decision to abandon the bomb, which in turn might lead Algeria to reconsider its own position. In short, a nuclear Islamic Republic would be a game-changer that would complicate U.S. interests in the region for decades to come. That said, Washington need not fear that an Iranian leadership with a handful of nuclear weapons would cause the U.S.'s demise. Israel, however, cannot be so certain. 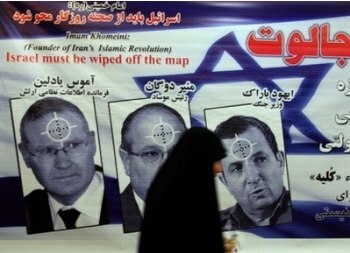 The Jewish state's destruction is at the center of Islamic Republic foreign policy. Whereas pundits like Cole dismiss Iranian President Mahmoud Ahmadinejad's 2005 declaration that "Israel must be wiped off the map," (the state-controlled press actually used the phrase in its official translation), the fact remains that various Iranian officials have subsequently repeated the call, often in equally coarse language (pdf), an inconvenient fact that Cole ignores. While Iranian diplomats promise that the Islamic Republic has no intention to build, let alone use, a nuclear weapon, senior Iranian clerics have suggested otherwise. On December 14, 2001, former president Ayatollah Ali Akbar Hashemi Rafsanjani famously declared, "The use of an atomic bomb against Israel would totally destroy Israel, while the same against the Islamic world would only cause damage. Such a scenario is not inconceivable." On February 14, 2005, Ayatollah Mohammad Baqer Kharrazi, secretary general of Iranian Hezbollah, said, "We are able to produce atomic bombs and we will do that. We shouldn't be afraid of anyone. The U.S. is not more than a barking dog." Just over three months later, Hojjat ol-Islam Gholam Reza Hasani, the supreme leader's personal representative to the province of West Azerbaijan, declared possession of nuclear weapons to be one of Iran's top goals. "An atom bomb . . . must be produced as well," he said. "That is because the Qur'an has told Muslims to 'get strong and amass all the forces at your disposal to be strong.'" That Hasani is unpopular among many Iranians is irrelevant: As a confidant of the supreme leader, he provides a window into his thinking. Many in Europe and the U.S. argue that Israel's fear of a nuclear Iran is paranoid. The Islamic Republic knows that any nuclear strike against Israel would result in massive retaliation. Because the Iranian regime is not suicidal, they say, it would never risk a first strike. This summer's unrest, however, raises another possibility, one that Israeli policymakers understand too well. Should public protest spin out of control with regime collapse inevitable, the supreme leader or the Islamic Revolutionary Guard Corps hierarchy might decide to launch a strike on Israel — fulfilling an ideological goal, in the knowledge that the chance of international retaliation would be slim with the Islamic Republic already having become an artifact of history. It is for these reasons that Israeli officials across their political spectrum — from Meretz and Labor on the left to Likud and Yisrael Beiteinu on the right — consider a nuclear-weapons-capable Islamic Republic of Iran an existential threat. On June 7, 1981, the Israeli air force destroyed Iraq's nuclear reactor at Osirak in a surprise attack. The mission was successful, but the secret deliberations ahead of the strike had been heated. Then, as now, analysts argued that a military attack would only delay the adversary's nuclear program, not end it. However, for a confluence of reasons — the Iran-Iraq War and Operation Desert Storm, sanctions, and perhaps IAEA's inspections — the Iraqi regime was never able to constitute its full nuclear program. The delay inflicted by the Israelis outlasted the Iraqi regime and, despite international outrage, most historians and analysts today acknowledge that the attack was the right decision. Not surprisingly, therefore, the Osirak strike is often voiced as the model should Israel decide to launch a similar attack on Iran's nuclear program. The two situations, however, are not analogous. Iran is further away from Israel, and almost four times the size of Iraq. Iraq's nuclear program was concentrated in Osirak, and the nuclear reactor itself above ground and vulnerable. Iran's nuclear sites, by contrast, are scattered across the country, heavily fortified, and sometimes buried below mountains. Israeli planes would need to fly more than a thousand miles across hostile lands and require refueling only to reach Iran. Even if Israeli bombers penetrated Iran with surprise, they would need to fly several hundred miles over Iranian territory after dropping their payloads. This might require additional targeting of the Islamic Republic's air-defense and communications infrastructure. To destroy just the physical aspects of the Islamic Republic's nuclear program would require at least 1,400 sorties, the sheer scope of which Israel is incapable of executing by itself. To cripple Iran's nuclear program, however, would require less. Israeli officials need not destroy the entire program, but only certain components — such as the centrifuge cascades — in order to delay the program by one, two, or three years. Furthermore, Israeli fighters do not have to destroy a facility to render it useless. The Islamic Republic may feel its facilities invulnerable if buried under mountains, but the Israeli military must only destroy the entrances to such facilities, entombing the scientists and engineers inside, to meet their objectives. Such a strike would not be ideal: Iran's retaliation, whether direct or by proxy, would be ferocious. What too many American pundits and analysts do not understand, however, is that if Israel feels itself facing an existential threat, then, by definition, it has no choice but to at least try to eliminate that threat. That the Israeli military could force a delay in Iran's nuclear program is without doubt. Whether they should try, however, is another question. Put aside traditional discussion of retaliation. Hezbollah would strike. Oil would spike and terrorism would again become epidemic. And while Iran may only be capable of shutting the Strait of Hormuz for a day or two, its proxies would destroy the southern Iraqi oil fields, a far more devastating outcome for the international community. Only some of this would be of paramount concern to Israel, especially when balanced with threat of its own annihilation. Still, the aftermath of a strike may not go as Israeli officials plan. However Iranians may feel about their current leadership, they are, without doubt, fierce nationalists. The best thing that ever happened to the Islamic Revolution was Saddam Hussein's invasion, as it allowed Ayatollah Ruhollah Khomeini to consolidate control at a time when the revolutionary forces threatened to spin out of control. Any attack on Iranian soil would again enable the regime to rally the Iranian people around the flag. Some analysts and Iranian exiles argue that, faced with bombing, ordinary Iranians — dissatisfied with their government's poor stewardship of the economy and repressive social policies — might turn on the regime. This is wishful thinking: Even if it were true, the Iranian government is master of the information operation. Word would soon spread that the Israelis had hit a school bus, or kindergarten, or shot down a civilian jetliner, allowing the Iranian government to exploit the cultural theme of martyrdom to the advantage of Ahmadinejad. Meanwhile, international diplomatic opinion would turn fast on Israel, even if months later, as with the Jenin massacre, Muhammad al-Durra shooting, or Gaza school bombing, the charges turned out to be false. It is doubtful that the Obama administration — or even many in Congress — would rally to Israel's defense. Israeli officials may believe that, as with Iraq, even a temporary delay would enable the Jewish state to outlive the Islamic Republic. This too would also be a miscalculation. The Islamic Republic has long made tenuous arguments about its own defensive needs. Should there be any attack on Iran, however, Tehran would have an excuse to develop a military nuclear capacity with an international community less willing to intervene than it is now. But would a delay not achieve Jerusalem's aims? Likely not: With regard to Iraq, Israel benefited from Saddam Hussein's stupidity. Had the Iraqi leader not invaded Kuwait, then he could have quickly reconstituted his nuclear program with the help of France or Russia. Iran will not be so constrained. Indeed, not only in China and Russia, but also in Europe and in the U.S., politicians and diplomats cite the Iraqi sanctions regime as something never to be replicated. Israel might push back completion of an Iranian bomb by a year or two, but the factors that prevented Iraq from reconstituting its bomb program simply do not exist in Iran. Nor could Israel then simply remain vigilant and hope that the international community would prevent Iranian access to uranium, as the Islamic Republic is able to mine enough uranium locally to enable it to develop enough bomb-grade material for several bombs. In short, an Israeli strike might buy time, but it would not buy enough time. The Islamic Republic would arise from any attack with greater lethality than before. Any attack would be a huge gamble, albeit one that Israeli leaders are likely to take given the inability of the P5+1 to raise the cost of Iranian defiance to the point that the supreme leader, to paraphrase Khomeini's statement on ending the Iran-Iraq War, drinks his chalice of poison and agrees to step back from the brink. Alas, because the Western world does not share Israel's threat perception, it is neither likely to force upon the Islamic Republic the degree of coercion necessary to achieve a change of regime behavior, nor is it willing to lay the groundwork — through support for independent trade unions, independent civil society, and democratization — to assist Iranians seeking fundamental change in the nature of their regime. This will leave Israel with no choice but to act, setting off a cascade of events that will ultimately force the decisions that Obama ignores now.